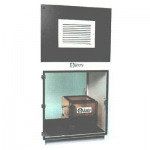 Class 100 (ISO 5) Pass-Thru module with a high velocity air wash of 100 FMP through a HEPA filter 99.99% efficient of particles 0.3 microns or larger. Laminated novaply, stainless steel or CRS inside and out, specify when ordering. Optional perforated stainless steel shelves for unobstructed airflow. Available in recirculating or non-recirculating models. Also available with ULPA, 99.999% efficient filtration.